One of two brothers to become placekickers in the NFL (his older sibling Chris kicked for the Bengals, Raiders, and Chargers), Bahr received All-America honors in college after connecting on 81.5 percent of his field goals and was chosen by the Steelers in the sixth round of the 1979 NFL draft. He also played soccer, in college and professionally with the Colorado Caribous and Tulsa Roughnecks of the North American Soccer League, before joining the Steelers. Bahr kicked 18 field goals and a league-leading 50 extra points for Pittsburgh in 1979, a season capped with a Super Bowl victory, and played a second year before being beaten out by David Trout in the ’81 preseason and moving on to the San Francisco 49ers. 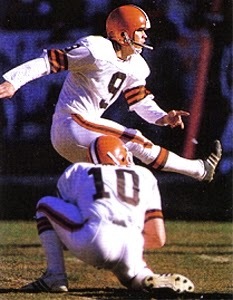 He was traded to Cleveland four games into the season and, while there were concerns about the length of his kickoffs, Bahr connected on a solid 13 of 20 field goal tries. Following a lesser year in 1982, he rebounded in ’83 to lead the NFL with an 87.5 field goal percentage (21 of 24). Browns went 5-11 to finish third in the AFC Central. Bahr spent another five seasons with the Browns, although injuries were a factor when he tore knee ligaments while making a tackle in 1986 that cost him the remaining four games that year, the postseason, and most of ’87. After kicking 143 field goals and 248 extra points, resulting in 677 points for the Browns, Bahr moved on to the New York Giants in 1990 and, in addition to 17 field goals in 13 regular season contests, booted five field goals against the 49ers in winning the NFC Championship game 15-13. He also was successful on both of his three-point attempts in the one-point Super Bowl win over Buffalo. After two more years with New York, Bahr started the 1993 season with Philadelphia, who waived him in December, and finished up with New England, where he kicked a career-high 27 field goals in ’94. He played one more season for the Patriots (and was cut in the 1996 preseason in favor of rookie Adam Vinatieri) and concluded his 17-year career with 300 field goals out of 415 attempts (72.3 %), 522 extra points, and 1422 points, which ranked ninth in NFL history at the time.